My aunts and uncles used to exchange stories about their culturally conservative father visiting Fadumo-Nakruma Ali Jama, a well-known Somali musician and stage performer, to deliver a message from her father. When she came to the door, he fled in shock because her outfit was so revealing. I visited with Fadumo-Nakruma last Friday to confirm the encounter with my grandfather. She was rehearsing for a play called “The Result of Civil War and Rush to Overseas,” part of the Somali Museum of Minnesota's second anniversary celebration. Instead I discovered Fadumo-Nakruma had a remarkable career in the Somali arts spanning more than 50 years. She even tutored Stevie Wonder on Afro-Soul music. Fadumo-Nakruma joined the Somali National Army in 1964 as a nurse recruit to support her country while it was warring with Ethiopia over disputed territory. The same year she auditioned for a play called “No Sitting Down,” designed to boost soldier morale. She wowed the judges and “the rest is history,” she said. She sang two songs during that first play in Mogadishu and met her first love. The government-sponsored band of actors, singers and writers were preparing to tour their show to other cities in Somalia, but her new lover didn't want her to go. Fadumo-Nakruma obliged. She was jailed for 40 days for refusing to travel. She stopped performing for a while, returning four years later as the mother of four young children. In 1977, she traveled to Lego, Nigeria, with a group of Somali performers to compete at the Festival of Africa and Black Nations for the Arts. She won an award in the Afro-Soul category with a rendition of the love song "Love is Not Mirage." Here is a grain video of Fadumo-Nakruma's award-winning performance. She told me Stevie Wonder was in the audience that night and joined her onstage at the award ceremony. The pop star was staying at the same hotel as the Somalis, and Fadumo-Nakruma befriended him. She ended up coaching him on Afro-Soul. Wonder was searching for his African roots, Fadumo-Nakruma said. He was a good student. 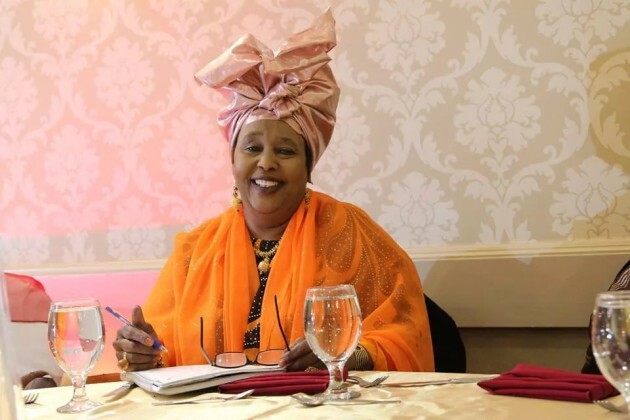 Fadumo-Nakruma worked in radio and television in the 1980s. She fled from Somalia to Canada in 1991 upon eruption of the civil war. I asked about her secret to career longevity and how she managed to stay relevant for such long time. Adaptability,” she told me. In 1996, she was the lead actor of “Incomplete,” a play about Somali life in North America. In one passage Fadumo-Nakruma sang an R&B song with English lyrics, connecting with Americans of Somali descendent. She brought that audience connection to the Twin Cities last Saturday. Nearly 1,000 Somalis, many born and raised in Minnesota, jammed the Hopkins Center for the Arts to see “The Result of Civil War and Rush to Overseas.” The presence of this many Somalis in a suburban Minnesota theater is certainly one result of that civil war. Osman Ali, founder and executive director of the Somali Museum of Minnesota, was elated with the event's sucess. Fadumo-Nakruma Ali Jama's participation was crucial to the event's success, he said.